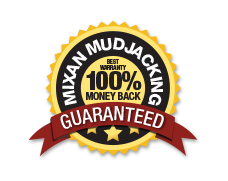 FAQs | Mixan Mudjacking Inc.
How much money will I save by mudjacking? Mudjacking is approx 1/2 - 1/3 the cost of concrete replacement. Average mudjacking jobs usually take 1 - 2 hours. Larger jobs take longer but usually not longer than 1 day. What can be mudjacked? What cannot? All concrete can be mudjacked. Examples include driveways, steps, patios, pools, basement floors, garage floors, sidewalks, grain bins, city streets, boat ramps, parking lots, interior floors, loading docks, runways, highways, schools, generator pads, warehouse floors, and more. There may be a few circumstances when concrete cannot be mudjacked. It is best to get an estimate to find out. Also, if the concrete is severely broken up, it is usually better to have it replaced than mudjacked. Mudjacking is just a less expensive alternative to your concrete issues. When can you mudjack/power grout? When can't you? Retaining walls too close to the area can cause an issue and may not be able to be mudjacked. Every situation is different and should be looked at by a professional to determine if this process will work for your situation. How do rodents create problems? Rodents, such as moles or groundhogs, will tunnel under concrete slabs or next to foundations. When water runs down through these holes it can cause wash outs or ground settlement. When can we drive on the driveway? Vehicle traffic 4-6 hours for average size vehicles. Will my yard or sprinkler heads be damaged? Sprinkler heads do not get damaged. Yards, if dry, have no damage what-so-ever. If sprinklers are left on or the ground is soft, 1 - 3 inch ruts may occur from the hydraulic pump. How much room do you need to work? Can I expect to see any movement after the work is done? Our product does not shrink. The only time you would see movement is if the ground is not 100% compacted or you are getting water under our product washing out the soil and creating a void. Does your work make a lot of noise? No, our pumps sound like lawn mowers. Does your work make a lot of dust or debris? Drilling holes makes a little dust and if we have to saw cut your concrete this can sometimes make a lot of dust if water is not used. Water can be used to keep dust down if this is an issue for the customer. Yes, all concrete can crack especially lifting sunken slabs up into place. What can happen is when the concrete sinks it will get a stress crack on the bottom but will not necessarily be visible. When the slab is then raised, the pressure will release and the crack will show on the top. These cracks are not caused by the mudjacking but just made more apparent when raised. There can be cases where mudjacking will crack the concrete if the correct process is not used. This is why several holes are drilled in strategic places. Will the patched holes match my existing concrete? No, not 100%. On new concrete, holes will match better because of concrete being lighter in color. Older concrete may not match as well because patched holes are lighter than the original concrete. However, over time the concrete will darken with age. There are several reasons that can cause this problem. Click the following link for more information on Concrete Lifting. Concrete leveling is the process of pumping material under the slab to bring it back up to original height. This process consists of drilling 1 inch holes in the concrete slab. Pumping a mixture of grout underneath the slab to raise it to desired height. Then the 1 inch holes are cleaned out and cement is placed in the holes. Mudjacking was started back in the early 1900's. Back then they pumped actual mud and that is where the term mudjacking originated. Are there any problems associated with Mudjacking? If mudjacking is not done properly, too much force could cause cracking. This process usually takes only hour's compared to days. Vehicle traffic can drive on it in 4-6 hours versus 1-2 weeks. It is - 1/3 the cost of replacement. Landscaping and grass is not disturbed. You can walk on the concrete immediately where you cannot walk on concrete replacement for 1-2 days. This is important for commercial properties, including retail, hospitals, apartment complexes, or any heavily used walk areas. A void consists of a cavity under the concrete where dirt or rock has been washed away due to water or ground settlement. In return, the concrete is not supported properly and will cause sinking over time. This process can last many years, decades, because our product is crushed rock so it will not settle or deteriorate over time. However, if the ground is not 100% compacted or there continues to be soil washed out under the product this may re-occur. If it does, these slabs can be lifted back into place again using the same holes. Typically most concrete can be raised. However, there are many circumstances to consider. It is best to get an estimate to find out. Also, if the concrete is severely broken up, it is usually better to have it replaced than mudjacked. Can Concrete Slabs be lowered? No, not by the mudjacking process. However, the other slabs adjoining the higher slab could be raised up. Another alternative is concrete grinding to reduce a trip hazard. My front steps they have sunken, and there is a gap at the top. Can they be raised? This is a common problem with steps. Mudjacking will usually fix this problem. It can be leveled but not lowered. For mild cases, the adjoining slabs can be lifted to match the height. Or the lifted slab can be ground on each end to reduce trip hazard. Otherwise, replacement is suggested. Mudjacking is approx - 1/3 the cost of concrete replacement. Will the holes used in leveling be a different color than our existing cement? On new concrete, holes will match better because of concrete being lighter in color. Older concrete may not match as well because patched holes are lighter than the original concrete. However, over time the concrete will darken with age. How long will it take to get my work done? Once the bid is accepted it may take 1-3 weeks depending on the current workload. However, if this is something that needs to be done ASAP it can be scheduled in 1-2 days. Average mudjacking jobs usually take 1 - 2 hours. Larger jobs take longer but usually not more than 1 day. How and when is 'grinding' used? Grinding can be used when slabs cannot be 100% leveled. Also if mudjacking cannot be used, grinding can take concrete down to reduce trip hazards. This is also a much cheaper process than replacement. Grinding is the process of shaving concrete down to the desired height. How many holes will there be? This depends on how large of an area and how the concrete has sunk. What makes your mixture (slurry) better than anyone else's? All the mudjacking companies usually use the same materials. However, certain situations will determine if different material is used and different slurry mixtures. How long does the concrete slurry take to dry and how do you fill the holes? The time for the slurry to dry will depend on portland mixtures. And if fly ash is used, typically it will dry between 1 - 8 hours. It also depends on the quantity used. Holes are cleaned out and patched with cement. Yes, caulking joints and drainage is a large factor. 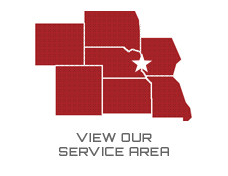 Click the following link for more information on Concrete Maintenance. What effect does it have on my existing landscaping? The mudjacking process is used to fill cinderblock walls or voids. What causes slabs to sink or become void? There are several reasons that can cause this problem. Click the following link for more information on Why Do Concrete Slabs Sink? Does having something mudjacked mean there were structural problems? Usually not, but in some cases this could be the issue. How can I prevent my slab from becoming void or sinking again? Make sure the soil is 100% compacted (water soaking is the best compaction method). Also, make sure all ground is sloped away from home. Gutters and downspouts working properly and all concrete joints and cracks are sealed to keep water from working under the slab. Yes, they are registered with the state. "THANKS FOR FIXING THE TRIP HAZARD AT THE ENTRANCE OF OUR RESTAURANT. IT WAS GREAT TO GET IT FIXED AND NOT LOSE ACCESS TO THE FRONT DOOR. WE COULD NOT BELIEVE PEOPLE COULD WALK ON IT THE SAME DAY. WE THOUGHT WE WOULD HAVE TO CLOSE DOWN FOR AT LEAST ONE DAY AND LOOSE THAT BUSINESS. YOU GUYS ARE THE BEST..."